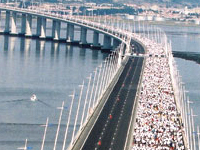 The Marathon will take place on October 20, 2019 from the town of Cascais, the Half Marathon and Mini Marathon (8,5Km) starts from the Bridge Vasco de Gama, Lisbon. The Marathon and Half Marathon distances are official and approved by the Portuguese Federation of Athletics and AIMS and will be run in respects the international rules of road races (I.A.A.F.) as well as the national requirements outlined in the road race charter and is organized by Maratona Clube de Portugal. The race is open to all athletes. The competitors must be at least 18 on the race day. Age categories will be given a separate classification in agreement with the Portuguese Federation; Federação Portuguesa de Atletismo) (F.P.A.). The Mini Marathon is not ranked. You are reminded that inspections will be carried out during the race to ensure that the regulations of the race are respected. 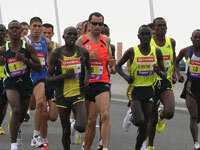 It is especially pointed out that runners compete in the race under their own responsibility. The official online or the optional entry form must be completed by each intending competitor. Completion of entry form and payment of the entry fee represents acceptance of these terms and conditions. Foreigners living in Portugal must register through the Portuguese web site: http://inscricoes.maratonaportugal.com/ following it's instructions and justifying a title of residence or student card. 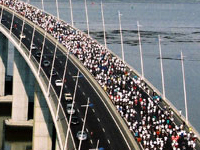 Road safety is under control of the police department; medical services are provided by professional medical services of the Portuguese Red Cross on the race course and at the finish line. They are able to stop any competitor for medical reasons. Competitors will be permitted up to 3:00 for completion the course of the Half Marathon and 06.00 for the distance of the Marathon. After the "end of race" vehicle has passed, competitors should thereafter respect the Highway Code. Bibs must be fully legible during the whole race on the bust; it can be neither folded, occulted nor its publicity modified. It will not be allowed the participation of competitors without number. On the internal part of the bib, it is recommended to mark any important medical information likely to be useful in the event in case of urgency. Jointly with the bib, you will receive your (chip) which you will have to attach in the bootlace of your shoe. It will be disqualified which one who will run without the chip, or will place it at an inadequate place or will take part with that one of another participant. Any person retroceding his bib to a third party will be held responsible in case of an accident arising or provoked by this third party during the competition. The organization is exempt from all responsibility in case of an accident in this type of situation. Bibs will be available upon presentation of confirmation of each registration and an identity card. Bibs cannot be mailed and cannot be collected on October, Sunday 20, 2019. Bicycles or motorized vehicles are strictly forbidden on the course. 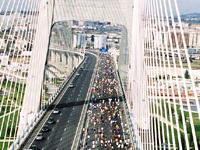 I release FPA or AIMS (and their directors, officers, employees, volunteers, contractors or agents ) from any liability (to the extent permitted by law) for any loss, injury or damage suffered in relation to my attendance and participation at the "Rock 'n' Roll Marathon of Lisbon EDP" or Vodafone half marathon RTP rock'n ' Roll, however so caused, including due to any negligence or other act or omission of F.P.A. or AIMS (or their directors, officers, employees, volunteers ,contractors or agents) To the best of my knowledge, I am not suffering from any condition which would prevent and/or render me unfit to participate in the Event. Name and likeness. Competitors expressly and exclusively grant to Running Portugal and its assigns, the irrevocable right to use a competitor's name, likeness, biography, factually or otherwise in connection with the production, the distribution and exploitation of the pictures related to the whole event, worldwide in any and all devices, media whatsoever, now known or hereafter known, for the entire duration of the protection period currently awarded by legislative or regulatory bodies, court decisions and/or arbitrages in any country, and currently existing of future international conventions, including eventual prolongations which may be made to this duration. I undertake to comply with all applicable regulations, by laws and rules of the IAAF, F.P.A.or AIMS in relation to the Event and will comply with all reasonable directions and decisions of the officials, and other representatives of IAAF, F.P.A. or AIMS. I agree that I will attend the official Race Registration which will take place in Lisbon during race opening days where I will collect my bib electronic timing chip and other race material. 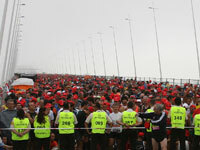 I agree to abide by the event rules, which are available at www.running-portugal.com - I, being the competitor have read and agree to these terms and conditions. -Bib Number: all packages will be given in the "Pavilhão de Portugal" Parque Expo, between 17 and 19 october, from 10.00am to 08.00pm, only under presentation either a document proving the payment of your entry fee or the e-letter you have received after your registration online and your I.D. Absolutely no bib numbers will be available for pick up on race day, Sunday, october 14. YOUR BIB NUMBER PICK-UP CARD AND A PHOTO I.D. ARE REQUIRED TO PICK UP YOUR BIB NUMBER! Registration fees are NON-REFUNDABLE and entries are not transferable. We're sorry, but we cannot admit exceptions. If you cannot participate, you may not sell your registration. You cannot transfer your registration to next year's event, nor for future events in the Rock 'n' Roll Marathon Series. Você termina a sua distância . Então vai receber a medalha ao cruzar a linha da Meta, da maratona, meia maratona ou mini maratona. EDP Meia Maratona de Lisboa. Você quer participar da Meia Maratona de Lisboa: 17 de Março de 2019.